Three NASA astronaut candidates and a JAXA astronaut pull an "injured" classmate or "crewmate," in this case, to safety following a simulated parachute evacuation over land. From left: Dorothy M. Metcalf-Lindenburger, Educator Mission Specialist, Robert L. Satcher, Jr., Mission Specialist; and Richard R. Arnold II, Educator Mission Specialist. The first phase of training is going quite well for NASA's new class of astronauts, according to one of their trainers. U.S. Air Force Maj. Ricky Thomas, tasked with preparing NASA astronauts for the rigors of spaceflight, said the new class and a trio of astronaut visitors from the Japanese Aerospace Exploration Agency (JAXA) have successfully completed water survival courses and moved on to flight training. "It's been going very well," Thomas told SPACE.com from Pensacola Naval Air Station in Florida, where training is underway. "The hardest part has been to get folks to realize that a lot of the things we normally teach them are just an introduction." The NASA and JAXA candidates are in the middle of a six-week program to learn splashdown, survival and retrieval techniques in the event of water parachute landing. They are also receiving ground and air training on the Beechcraft T-34 Turbo 'Mentor' aircraft, and are currently at work on flight communications and navigation. "In the T-34, the students fly in the back seat," Thomas said, adding that a hood shrouds the outside world from the student. "So they are totally focused on their navigation console." In addition to being dragged through the water in a parachute harness and "retrieved" from choppy water with rain pouring down, the space trainees have gone through simulated ejections from aircraft and learned how to help fallen crewmates over land. Much of the training has also been conducted in the classroom, where the future astronauts are taught the importance of trusting their gear as well as each other. Thomas said the astronaut training program has been a crash course of sorts, since other training courses are typically twice as long. "So it's a bit like drinking from the fire hose for these folks," he said. "And there's an enormous amount of varied background among them, some with flight experience and some without." 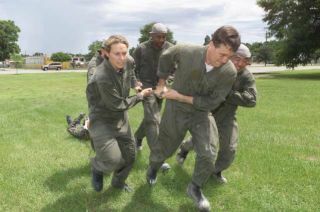 Astronaut trainers were able to take that variation into account using a prearranged curriculum in place at the naval base. The naval training is primarily geared toward water survival, and well suited to NASA needs since its manned missions lift off over the ocean, Thomas said. Once the JAXA astronauts and NASA candidates complete their first phase of training, they're expected to move up to flight training on NASA's T-38 aircraft, he added.